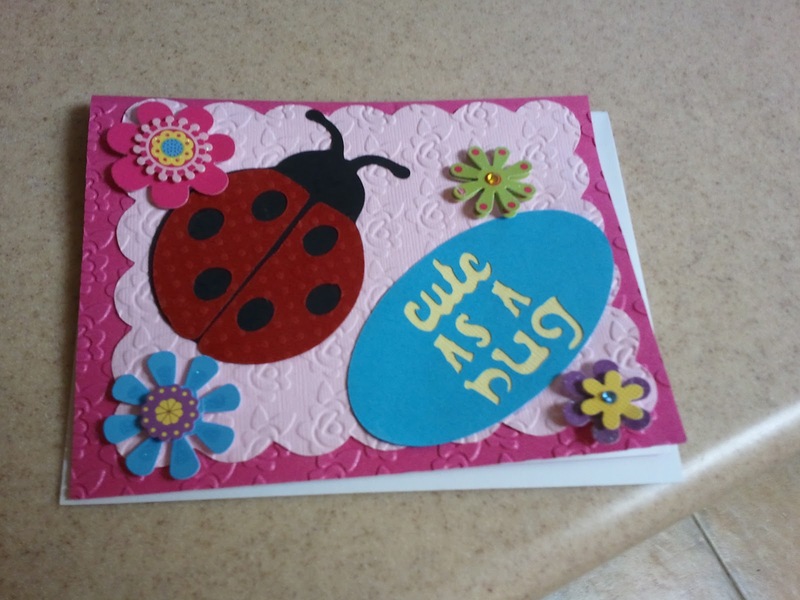 Megan made this card for someone who helped her gain more independence. Megan used the cuttlebug on the lilac paper- with her left hand which had been operated on extensively this summer. This made a star texture for the background. This card was made with the Create a Friend cartridge which Megan received yesterday for her birthday. 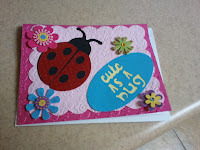 Megan is having hand surgery tomorrow and she was still making cards today. She finished some birthday and anniversary cards and a special Baptism one. These will be given out in the next few days. Below is a special thank you note for the Borough President Jim Molinaro. Mr. Molinaro held an Autism Awareness night with the fun theme of "Beatles Blast". The Richmond County Ballpark was packed with a very happy audience enjoying local talents. The fun night even showcased two groups of special Staten Islanders who serenaded the crowd. Megan sang with On Your Mark and I never heard "All You Need Is Love" sound so good. Below is the picture of Megan this afternoon at work on her Cricut Expression and the thank you note. Megan finally completed some cards for the Wounded Warrior Project. We can never make enough cards for this cause. As she gets ready for surgery next week, we will try to work on another batch. With her Cricut Expression, Megan used the Animal Antics cartridge to make the koala astronaut. The spaceship was from the Everyday Paper Dolls. The words were from Animal Antics and, I believe, Beyond Birthdays. This bear is too cute to be this serious! Megan loves the fact that this bear has a bow tie and a laptop! Megan made this thank you note for my Godparents- who really are like Guardian Angels. Megan loves the Teddy Bear Parade Cartridge. Here is a picture of the thank you notes we are still working on. Megan wanted to have baseball fan bears for the notes. We still have a lot to do, but wanted to share. Megan was a 2011 New York Yankees HOPE Week honoree in 2011. The New York Yankees gifted her with a special lemonade stand that now goes on the road for fundraising. On June 23 the Staten Island Yankees hosted the stand at the Richmond County Ball Park and the lemonade stand raised over 4300 dollars for the Manresa Columbian Club. The Manresa Columbian club is the home of the Manresa Knights of Columbus and the Columbiettes (2147). Megan is a member of the Columbiettes and the Manresa Columbian club was devastated in Hurricane Sandy and had to be rebuilt in order to keep delivering charitable works and services to the neighborhood which was hit so hard. Congratulations to the 2013 New York Yankees HOPE week honorees whom are being honored this week. You truly are an inspiration to us all. 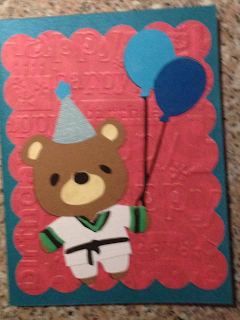 After doing over 115 umbrella 'favors' for the Columbiettes charity tea, Megan has been busy making birthday cards! Megan is making favors for a fundraiser in mid-April. The fundraiser is being run by the Manresa Columbiettes Auxiliary- of which she is a member- and it is a "spring tea" with the theme of April Showers. These cute umbrellas will all have labels on the back thanking attendees. The fundraiser is to rebuild our Council in Staten Island since it was demolished by Hurricane Sandy. Couldn't wait till that day to share- look at her face and how happy she is. She decides- and there is no arguing with her- what colors and how to decorate each one. She made over 70 and is about halfway there! Megan wanted every student in her school to have a homemade valentine- so last Saturday we were on a mission. 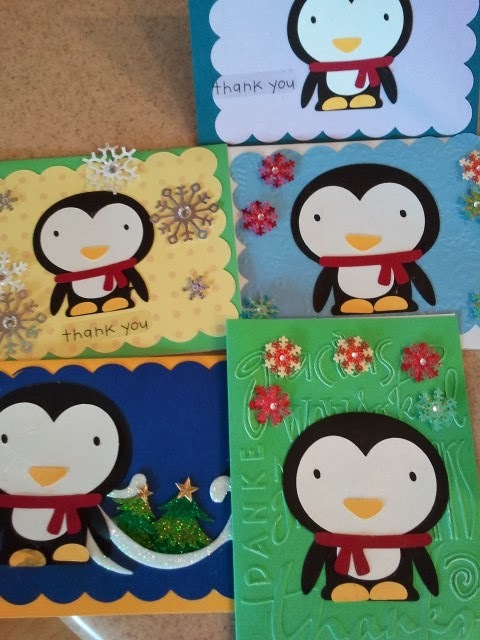 Each card and dog was cut from the Expression and inside were labels printed with a message.